Citation: Taylor B, “Dare to be Different: Innovation Versus the Status Quo”. ONdrugDelivery Magazine, Issue 92 (Dec 2018), pp 46-49. Efficacy and safety – will this drug work for my patient and help their symptoms? Insurance – is it covered and what are the costs? Can the patient afford this drug? Ease of use – how does this treatment fit into the patient’s day-to-day life? For injected products, can a patient administer a self-injection, or would they be better at an infusion centre? Do they have support at home to help them remember to take their medication and to manage any anxiety they may feel? Conversely, are there kids or pets at home? Would that make self-injecting at home more stressful and less desirable than other means? With the emergence of biosimilars and increasing competition, there is a threat that safety and efficacy alone may not meaningfully differentiate products. Access and payer strategies are certainly important, but that is a difficult area by which to differentiate oneself. What may make the difference with physicians and patients in such a competitive space is the drug delivery device. Drug delivery that fits into a patient’s day-to-day life, with minimal pain, disruption and hassle is an important consideration for doctors as they choose what to prescribe. Needle-free drug delivery can solve that lifestyle challenge and presents a significant improvement in the way that injectables are delivered. The concept of a “needle-free” device has been around for decades (Figure 1). 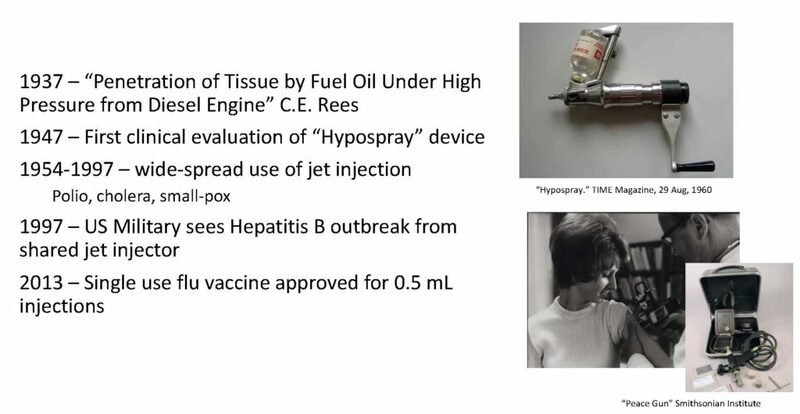 First assessed in the 1930s and made popular via Star Trek’s “Hypospray”, the broader use of needle-free injectors did not occur until the 1980s. These legacy needle-free delivery systems were powered by mechanical or gas-based means with limited pressure controls and poor regulation of injection depth and volume, which resulted in low-volume, painful and loud injections.1 As such, needle-free drug delivery was not widely adopted. Figure 1: A brief history of needle-free devices. 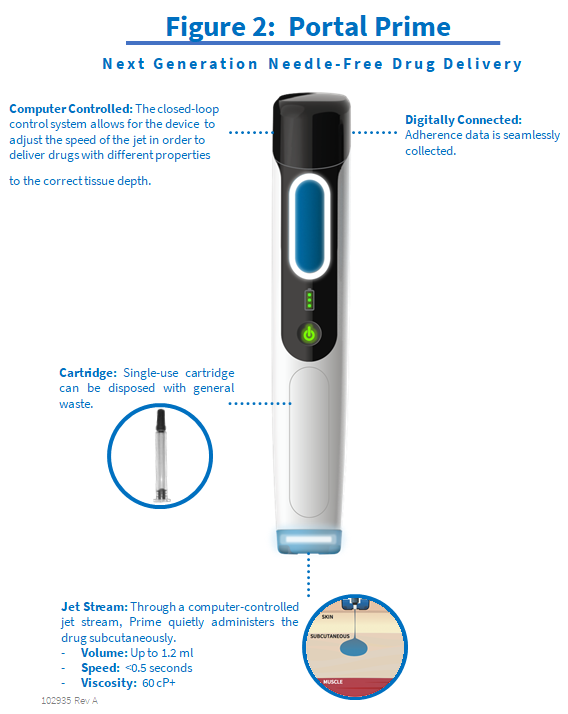 Portal Instruments is reinventing needle-free drug delivery (Figure 2). 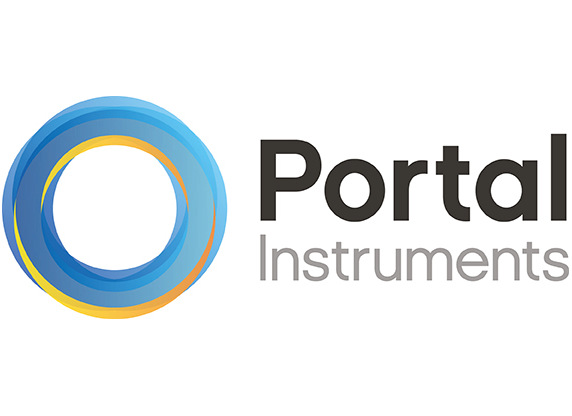 Portal Instruments’ Prime device administers the drug through a computer-controlled, highly-pressurised jet stream. The narrow jet pierces through the epidermis and delivers the drug into the subcutaneous space (Figure 3). One of the advantages of Portal’s needle-free device over needles is the jet-stream’s 200 μm diameter, whereas commonly used needles have a diameter of 400 μm (27 gauge), as shown in Figure 4. The drug is delivered from a one-time use, sterile ready-to-fill (RTF) cartridge that is provided to the fill/finish manufacturer in a standard 16 x 10 nest and tub. The design of the cartridge and nest and tub format enables seamless, easy product filling. Figure 2: Next generation needle-free drug delivery. In Prime’s closed-loop system, the computer-controlled motor and internal feedback control system work together to sense the pressure and adjust the velocity of the jet-stream accordingly. 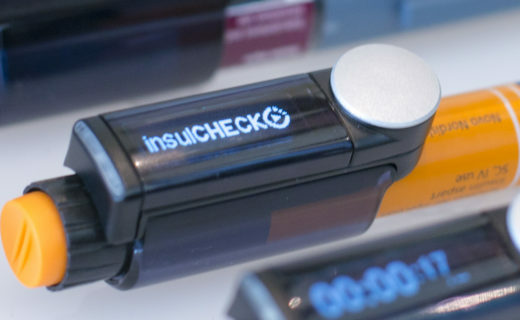 The device also provides feedback to the patient to lead them through the injection process, and to confirm that the injection has been completed. The Prime device has been successfully tested with a wide array of drugs, from small molecules to peptides and mAbs over 60 cP. Regardless of the viscosity, the subcutaneous injection is able to be administered in less than 0.5 seconds. Figure 3: A high pressure, narrow jet pierces through the epidermis, delivering drug into the subcutaneous space. Pharmaceutical partners can analyse aggregated and anonymised data to enhance pharmaceutical lifecycle management and use the quantitative insights to launch specific, targeted campaigns that drive population penetration and adherence programmes. Patient service providers can quickly identify “late doses” before they become “missed doses” and be proactive in reaching out to patients who may need support. Patients may choose to share this data with their physicians in order to have a more well-rounded picture of the progression of their disease. 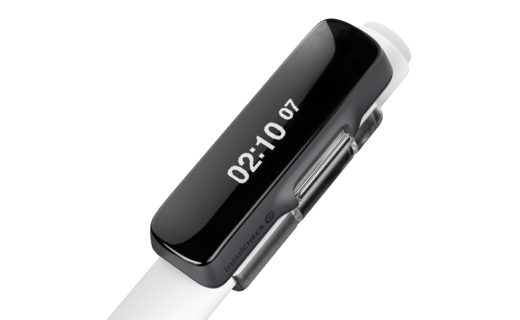 This insight may create more efficient physician visits and more tailored treatment plans. Payers could use this adherence data to inform value-based contracts that are dependent on adherence. 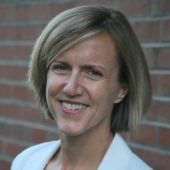 With data and analysis, teams will be able to identify challenges related to adherence, predict trends in patient populations, and use that data to create a better patient experience. It may also lead to trends that were previously undetected becoming noticeable. 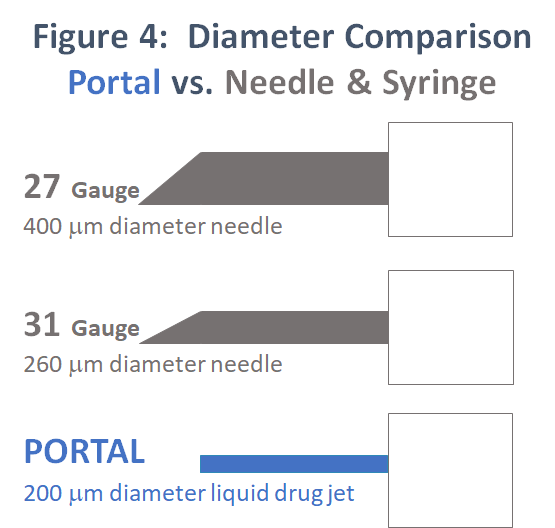 Figure 4: Diameter comparison of Portal’s Prime device versus needle & syringe. It is not uncommon for companies to tout innovation as a core pillar. There are several areas in which companies can innovate beyond the science of drugs to strengthen their positions as leaders. Drug delivery is an obvious choice for innovation as it can involve cutting-edge technology, lead to patient and physician preference, and set oneself apart by being radically different from a field of autoinjectors or prefilled syringes that are all fairly similar. Nevertheless, choosing to go with a new delivery solution may feel unfathomably risky versus staying with the tried-and-true needle and syringe. Numerous human factors studies have been conducted. 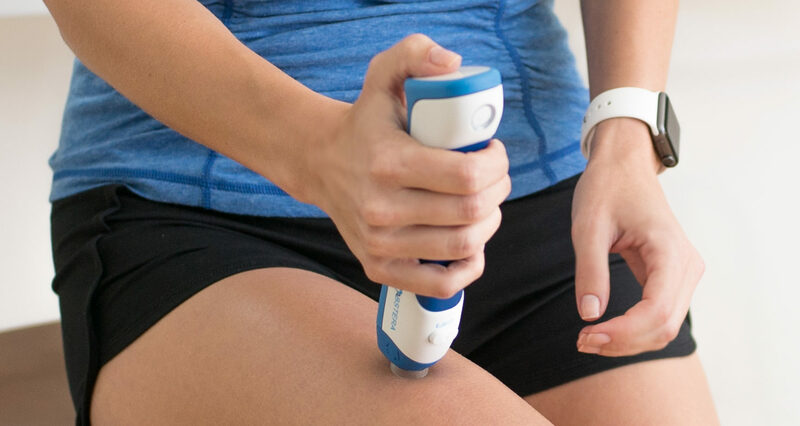 For companies that would like to test a particular asset with the Portal needle-free device, there is a straightforward evaluation process. The main question that pharmaceutical firms should be asking themselves is – what if my competitors go needle-free? Is there more risk in the status quo or being on the forefront of innovation? Ravi AD et al, “Needle Free Injection Technology: A complete insight”. Int J Pharm Investig, 2015, Vol 5(4), pp 192–199.